The Power Play 500 is a full sized Bingo blower consol. It is more than five feet long, two feet deep and nearly three feet tall. Flat-panel monitor with built-in speakers. Standard PC technology. Standard 101 keyboard/mouse. Fully Contained and Supported Windows XP Home Operating System. 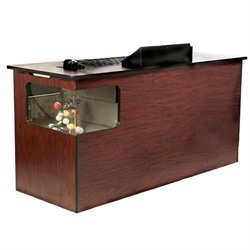 Compatible with the OMNI™ bingo management system, the e-BOS™ gaming systems, including Video King's PowerTouch™ fixed-base systems and Video King's full line of handheld bingo devices. Single "F" key operation for ease of use and speed of operation. PC Anywhere remote access software for program changes and troubleshooting. Supports complex pattern definitions, including mulit-level and multi-card sheet patterns. Touch screen Flat-panel monitor with built-in speakers added. Touch screen Flat-panel monitor with built-in speakers and RF Modulator added. CCTV/NTSC support added. No camera. Touch screen Flat-panel monitor with built-in speakers added. CCTV/NTSC support added. No camera.